RadGridView supports column reordering and it can be done by the user in run-time. 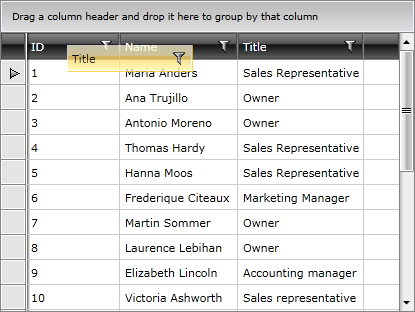 The user can drag the desired column's header at the desired position among the other headers and drop it there. RadGridView suggests different modes when reordering a column. You can control it through the ReorderColumnsMode property. There are two ways to disable reordering. 1. The first one is to disable it on RadGridView level by setting the CanUserReorderColumns property to False, which means that none of the columns will be re-orderable. The headers will be still draggable, but when you drop them nothing will happen. 2. You can also disable the reordering for a particular column by setting its IsReorderable property. In this case the columns will be visualized in the following order - Name, Country and Number. The default scrolling behavior of RadGridView while dragging its columns can be modified by configuring the ScrollingSettingsBehavior. To learn more read the Scrolling topic.